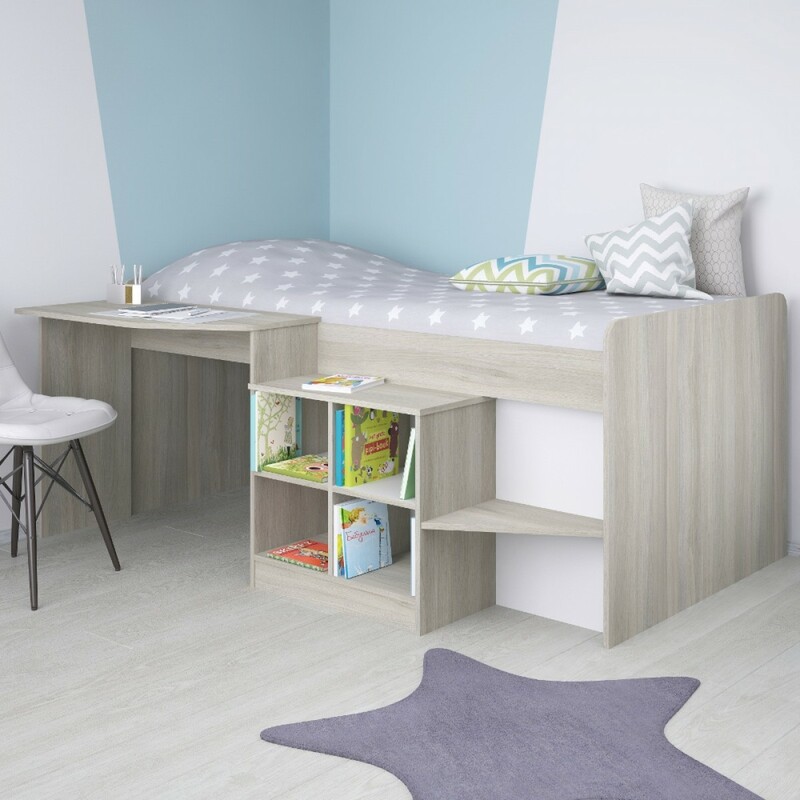 A delightfully compact, all-in-one style cabin bed, the Pilot Cabin Bed Elm provides kid's bedrooms with a cosy sleep station, some charming storage saving shelves and a modest desk, complete with ample room beneath to stretch their legs or fill in with other belongings. The Pilot Cabin Bed Elm truly bring everything to the bedroom your little one may need during their early school years. As well as being delightfully accommodating, featuring solid wooden slats, the sleeping area of the Pilot Cabin Bed Elm is exceptionally cosy and easy to access, thanks to the small yet stable step near the foot end of the bed. Next to this step are four concise shelving areas, the likes of which are perfect for storing and displaying books and toys. Attached to the head end of the Pilot Cabin Bed Elm is a small yet spacious desk. This area grants kids somewhere to do their homework, read or even doodle. There's even a spacious area that extends below the head end, with a slightly more condensed area stretching along the rest of the frame, which means that there's additional storage space under the Pilot Cabin Bed Elm. The Pilot Cabin Bed Elm adheres to a rustic, natural feeling aesthetic as it's adorned with an elm wood like finish. Crafted from thick and durable materials, the Pilot Cabin Bed Elm has been designed to last for as many years as it's needed. Despite being so durable the Pilot Cabin Bed Elm is incredibly easy to assemble, arriving in a flat pack format for ease of mobility and paired with comprehensive instructions.